Vanek was born in Baden bei Wien, Austria, to Slovak mother Jarmila and Czech father Zdeněk, who emigrated from the communist Czechoslovakia to Austria in 1982. He grew up in Zell am See (Salzburg) and in Graz (Styria), where his father played professional ice hockey. As a youth, he played in the 1997 and 1998 Quebec International Pee-Wee Hockey Tournaments with a team from Austria. In 1998, at the age of 14, he moved to Canada. 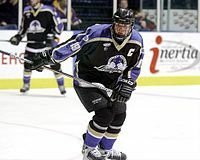 After playing junior hockey for the Sioux Falls Stampede of the United States Hockey League (USHL), Vanek joined the University of Minnesota Golden Gophers, leading the team in goals (31), assists (31) and points (62) in the 2002–03 season. In part due to his prolific scoring touch, the Golden Gophers won the 2003 NCAA National Championship. Vanek was named MVP of the Frozen Four tournament, scoring the game-winning goals in both the semifinal against Michigan in overtime and in the final against New Hampshire. He was also named Minnesota's team MVP for 2003, becoming the first freshman to receive the honor. He scored the most points by a Golden Gopher freshman in 2003 since Aaron Broten who scored 72 total points in 1979–80. He was the first freshman to lead the team in scoring since Mike Antonovich in 1969–70. His 31 goals also led all NCAA freshmen in goal scoring, and was fourth in the entire country. He was also the 2003 WCHA Rookie of the Year, the third Golden Gopher to win the award. Vanek was a member of the Austrian national team in the 2004 IIHF World Championships, where he collected seven points in six games (two goals and five assists). Vanek led the Golden Gophers in goals (26) and points (51) for the second-straight season and finished fifth in points among Division I leaders with 51. Vanek was the Twin Cities Best College Athlete for 2004. Vanek spent 2004–05 with the Sabres' American Hockey League (AHL) affiliate, the Rochester Americans, recording 68 points in 74 games and helped Rochester to the best record in the AHL. Vanek finished second on the team in points, 11 points behind Chris Taylor, but led the team in goals with 42 and in power play goals with 25. He finished second among rookies in points and led all rookies in goals scored, the latter of which was second in the league among all players. 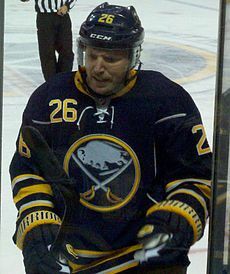 Vanek signed a three-year deal with Buffalo on 3 September 2004, and began playing for the Sabres in 2005–06 after a season with their AHL affiliate. He had a promising rookie season with 25 goals and 48 points in 81 games for the Sabres. His performance tailed off in the playoffs, managing two goals in ten games. Vanek recorded his best statistical season, the following year in 2006–07. He played in all 82 regular season games for the Sabres, scoring 43 goals, tied for fifth in the league, and 41 assists. He also finished an NHL best +47, earning the NHL Plus-Minus Award. Upon the expiration of his entry-level contract during the 2007 off-season, Vanek signed a seven-year, $50 million offer sheet from the Edmonton Oilers. The Sabres, having lost Chris Drury and Daniel Brière as free agents that off-season, immediately matched the offer sheet, thus keeping Vanek under contract until at least the end of the 2013–14 season. Despite his lucrative new contract, Vanek's production dipped to 64 points in 2007–08. In the midst of a more productive year, however, Vanek was named to his first NHL All-Star Game in 2009 in Montreal. He helped the East to a 12–11 shootout victory over the West. Earlier in the season, on 13 December 2008, Vanek helped the Sabres reach a milestone by scoring the 10,000th goal in franchise history. Following the All-Star Game, on 4 February 2009, Vanek made NHL history by becoming only the second player to score four consecutive natural hat-trick. He recorded his fourth natural hat trick, and fifth overall, in a 5–0 win over the Toronto Maple Leafs in HSBC Arena. It was also Vanek's fourth consecutive natural hat-trick, matching an NHL record set by Cy Denneny between 1923 and 1924 with the old Ottawa Senators. Later that week, on 7 February, Vanek took a slapshot from Anton Volchenkov of the Ottawa Senators, fracturing his jaw. He underwent surgery the next day and was announced to be out of the lineup for three-to-four weeks. At the time of the injury, Vanek was third in the league goal-scoring. At the end of the 2008–09 season, Vanek would score a total of 40 goals with 24 assists, totaling 64 points. He led the NHL in powerplay goals with 20. The 2009–10 season also started on a sour note, as Vanek sustained an upper body injury after scoring two goals in a 6–2 win against the Detroit Red Wings on 13 October. Vanek had scored three goals in four games up to that point. On 10 April 2010, he scored four goals against Ottawa (one on a penalty shot) in the first two periods. On 1 October 2012, Vanek signed with the Graz 99ers in Austria to play for them until 4 November 2012, during the 2012–13 NHL lockout. On 1 October 2013, the Buffalo Sabres names Vanek and Steve Ott captains; Vanek would wear the "C" for home games while Ott would wear the "C" for road games. On 27 October 2013, Vanek was traded to the New York Islanders for Matt Moulson, a conditional 2014 first-round draft pick and a 2015 second-round draft pick. He immediately joined the team's top line alongside John Tavares and Kyle Okposo, which Vanek said later was the best line he ever played on. On 4 February 2014, Vanek confirmed that he had turned down a contract extension offer from the Islanders. The contract was reportedly for seven years and $50 million, with Vanek stating that the Islanders move to Barclays Center was one of his primary reasons for leaving the team. On 5 March 2014, Vanek was dealt to the Montreal Canadiens in exchange for Sebastian Collberg and a second-round draft pick. On 19 March 2014, he scored his first three goals for the team – a hat trick in a game against the Colorado Avalanche that they went on to win 6–3. However, Vanek was noted for his lackluster performance during the 2014 Stanley Cup playoffs, including scoring just five even-strength points over 17 games. In late June, Canadiens General Manager Marc Bergevin announced that the team would not be re-signing Vanek, allowing him to become an unrestricted free agent. On 1 July 2014, Vanek signed a three-year, $19.5 million contract with the Minnesota Wild with a no-trade clause, turning down a three-year, $21 million offer to return to the Islanders. The signing reunited Vanek with former Sabres teammate Jason Pominville. With the Wild up against the salary cap and Vanek having endured an unsuccessful stint with the Wild, Vanek's last year of his contract was bought-out by Minnesota on 24 June 2016. On 1 July 2016, Vanek signed a one-year, $2.6 million contract with the Detroit Red Wings reuniting him with Co-Captain Steve Ott when a member with the Sabres. With the Panthers looking to make a playoff push, on 1 March 2017, Vanek was traded to the Florida Panthers in exchange for Dylan McIlrath and a conditional third-round pick in the 2017 NHL Entry Draft. Vanek recorded 10 points in 20 games with Florida, but ultimately the Panthers did not qualify for the post-season. On 1 September 2017 Vanek signed a one-year, $2 million contract with the Vancouver Canucks. On 20 December 2017, Vanek recorded his 10th career hat trick in a loss to the Montreal Canadiens. On 26 February 2018, the day of the trade deadline, Vanek was traded to the Columbus Blue Jackets in exchange for Jussi Jokinen and Tyler Motte. He recorded his 11th career hat trick in the same season on 27 March 2018, in a game against the Edmonton Oilers. On July 1, 2018, Vanek signed a one-year, $3 million contract for a second stint with the Red Wings. Vanek and his wife Ashley have three sons. They live in Stillwater, Minnesota. On 21 July 2014, Vanek's name was listed in records seized from The Marina Restaurant & Bar, a Rochester, New York, facility suspected of running an illegal gambling ring. For his part, Vanek denied all wrongdoing, cooperated with authorities and wasn't charged with any crime. ^ "Pee-Wee players who have reached NHL or WHA" (PDF). Quebec International Pee-Wee Hockey Tournament. 2018. Retrieved 11 February 2019. ^ a b Kujawa, Kyle (1 July 2016). "Red Wings add free agent Thomas Vanek". National Hockey League. Retrieved 28 March 2018. ^ a b Cazeneuve, Brian (21 April 2003). "Frozen Four Heroics Behind freshman Thomas Vanek, Minnesota became the first champ in 31 years to repeat". Sports Illustrated. Retrieved 28 March 2018. ^ "Thomas Vanek Named WCHA 'Rookie Of The Year'". keloland.com. 20 March 2003. Retrieved 28 March 2018. ^ "Thomas Vanek Signs Contract With Sabres". keloland.com. 3 September 2004. Retrieved 28 March 2018. ^ Allen, Kevin (6 July 2007). "Sabres keep Vanek by matching Oilers' $50M offer". USA Today. Retrieved 25 May 2010. ^ "Thomas Vanek signs seven-year offer sheet from Oilers". The Sports Network. 6 July 2007. Retrieved 15 April 2013. ^ "Sabres notebook: Vanek's hat trick is a natural wonder". Buffalo News. 5 February 2009. Retrieved 5 February 2009. ^ a b c "Buffalo Sabres LW Thomas Vanek out a month with fractured jaw". National Hockey League. 8 February 2009. Retrieved 28 March 2018. ^ "Sabres lose Vanek to broken jaw". Toronto Star. 9 February 2009. Retrieved 11 February 2009. ^ "Vanek to miss 'weeks'". Buffalo Sabres. 13 October 2009. Retrieved 14 October 2009. ^ "ALFREDSSON HONOURED BUT VANEK SPOILS PARTY WITH 4 GOALS AS SABRES BEAT SENS 5-2". thehockeynews.com. 10 April 2010. Retrieved 28 March 2018. ^ "Thomas Vanek News: Vanek will join the Graz 99ers in his native Austria during the NHL lockout, The Buffalo News reports". The Score. Retrieved 8 January 2014. ^ "Landeskog, Markov, Vanek head to European teams". USA Today. Retrieved 8 January 2014. ^ "Buffalo Sabres name Steve Ott and Thomas Vanek team captains". Sports Illustrated. Archived from the original on 8 January 2014. Retrieved 8 January 2014. ^ Stubis, Brain (27 October 2013). "Thomas Vanek traded to Islanders for Matt Moulson, picks". CBS Sports. Retrieved 28 October 2013. ^ a b "Wild's Thomas Vanek was done with Islanders when they were done with Long Island". Twin Cities. 2 February 2016. Retrieved 5 July 2017. ^ Rosen, Dan (7 January 2014). "Five Questions: Vanek happy to be with Islanders". National Hockey League. Retrieved 8 January 2014. ^ "Thomas Vanek rejects New York Islanders' offer, trade could be next". National Hockey League. 4 February 2014. Retrieved 5 February 2014. ^ "Vanek traded from Islanders to Canadiens – 2014 Trade Deadline". National Hockey League. 5 March 2014. Retrieved 5 March 2014. ^ "Vanek's hat trick lifts Habs over Avalanche in Roy's return to Montreal". The Globe and Mail. 18 March 2014. Retrieved 19 March 2014. ^ a b "Canadiens GM Marc Bergevin Confirms Thomas Vanek Won't Return To Team". New England Sports Network. 27 June 2014. Retrieved 4 July 2014. ^ "Vanek says Isles' move to Brooklyn a factor for him". Newsday. Retrieved 5 July 2017. ^ "Signing in Minnesota beyond Vaneks wildest dreams". National Hockey League. 1 July 2014. Retrieved 1 July 2014. ^ "Vanek's contract bought out". Minnesota Star Tribune. 24 June 2016. Retrieved 24 June 2016. ^ "Red Wings trade Thomas Vanek to Panthers". Sportsnet.ca. Retrieved 1 March 2017. ^ Kujawa, Kyle (1 March 2017). "Red Wings acquire pick and defenseman for Vanek". Detroit Red Wings. Retrieved 1 March 2017. ^ Woodley, Kevin (1 September 2017). "Vanek signs one-year contract with Canucks". National Hockey League. Retrieved 26 February 2018. ^ Clipperton, Joshua (20 December 2017). "Habs overcome Vanek's hat trick in wild win over Canucks". Canadian Broadcasting Corporation. Retrieved 28 March 2018. ^ "Jackets acquire Thomas Vanek from Canucks in exchange for Jokinen, Motte". National Hockey League. 26 February 2018. Retrieved 26 February 2018. ^ "Vanek's hat trick powers Blue Jackets past Oilers". sportsnet.ca. 27 March 2018. Retrieved 28 March 2018. ^ Kujawa, Kyle (1 July 2018). "Red Wings sign free agents Thomas Vanek and Jonathan Bernier". Detroit Red Wings. Retrieved 1 July 2018. ^ "Sabres' Vanek on his way back to Buffalo after time playing in Austria ends". The Buffalo News. Retrieved 11 February 2014. ^ Craig, Gary and Kevin Oklobzija (22 July 2014). Thomas Vanek questioned in Charlotte gambling case. Rochester Democrat & Chronicle. Retrieved 22 July 2014. ^ "NCAA Frozen Four Records" (PDF). NCAA.org. Retrieved 19 June 2013. This page was last edited on 7 April 2019, at 06:45 (UTC).